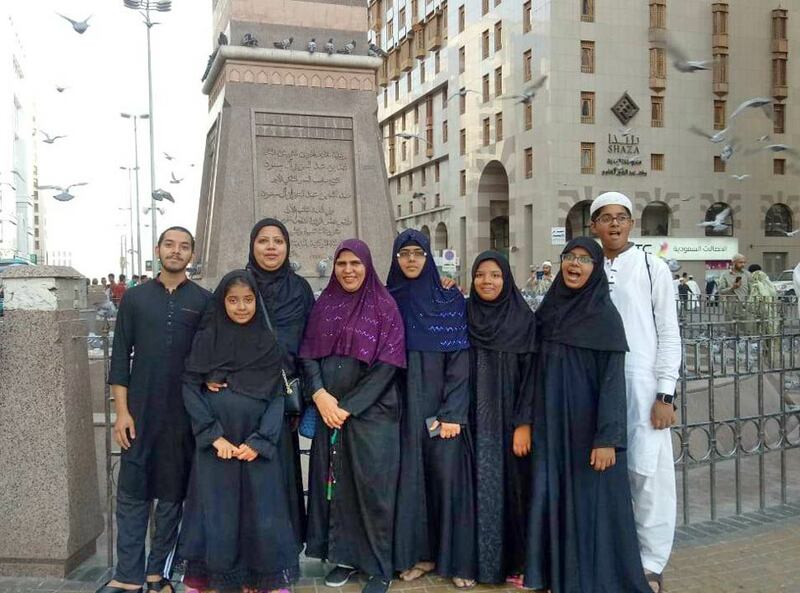 In September 2018, I planned to perform Umrah along with my wife, Zohra Iqbal, and my eldest daughter and her husband. As Zohra has been ill for some time but is now feeling better we thought it a good time to perform Umrah. When we broke the good news to my wife, she insisted that our family go together so we extended the invitation to all the children. A group of eleven was established and included my youngest daughter and her children. The following report was written by Engr. Iqbal Ahmed Khan's granddaughters. On October 06, 2018, Engr. Iqbal Ahmed Khan accompanied by fifteen of his family members reached the Jinnah International Airport, Karachi by Saudi Airlines and went to Madina Munawwara via Riyadh. Our hotel booking was made at Millennium Al-Aqeeq Hotel. We reached Madina and the representative of our Travel Agent received us and transported all to the respective hotel. It did not take long for us to take the room keys from the reception desk and we were in our rooms within twenty minutes. In our group, we had nine members who had never been to Saudi Arabia. 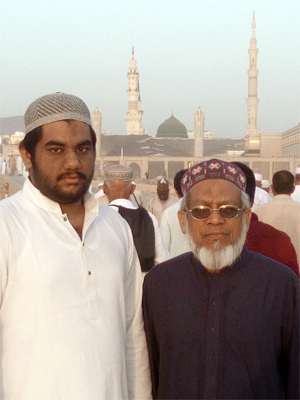 The first sight of Masjid-e-Nabwi was a dream come true for all of us. The astonishment of the nine members is impossible to put into words. We all followed the Azaan and started praying five times in the Masjid-e-Nabwi. On October 7th, 2018, which was our second day in Madinah the city of the Holy Prophet Muhammad ﷺ, we visited Roza e Rasool (the burial of the Holy Prophet Muhammad ﷺ which has 3 other graves of Hz. Abu Bakr, Hz. Umar and Hz. Esa (it is empty now but after his death, he will be buried there. At the moment, he is in the heavens in a deep sleep). Visiting the Roza-e-Rasool for men has no timing but for ladies, there were three times a day established: first, after Fajar prayers; second, after Zohr prayers; and, finally, after Isha prayers. It was always difficult to find a place to pray in Riaz-ul-Jannah. This portion has a green carpet and the pillars are also of different design. It is said that this part is a part of heaven. The ladies of the group managed to visit and prayed in Riaz-ul-Jannah in the time specified for them. The next day we all went for Ziarats along with a few other groups. We offered nafils at each place. The places we visited were Masjid-e-Quba, Masjid-e-Qiblatain, Mount of Uhad and a garden of dates. During the whole tour, the tour guide kept on giving us information about the places and also quoted verses from the Holy Quran with translation as well as some pieces of poetry. Later that evening we did some shopping for all the relatives in Karachi. We did purchase dates, a very famous and important gift from Madina. The Ajwa dates were the favorite. The group of our female members along with Obaid and Habib standing in front of Shaza Hotel. It was our second to last day in Madinah so Ata, Kiran, Hina, and Bushra decided to take all the children on a tour of the whole Masjid e Nabwi. During this tour, they saw Gumbat e Khizrah. It was a very jaw-dropping sight! Then they offered Ishraaq and later completed the tour by visiting Jannat ul Baqi. As women weren’t allowed to go inside, they stood outside and recited Fatiha. Then they completed the round and went back to the hotel. Later the next morning after breakfast, we sat on the bus which would take us to Makkah. It was a 52-seat bus and it had many people so it was very noisy. The seats were pretty uncomfortable as well. Until we arrived at the Meekat, the place where you put your Ihram (two white sheets of cloth for performing Umra), we kept on moving, we did not stop. When we arrived at the Meekat, we got off the bus and went inside the Masjid and offered 2 rakahs of nafil, then recited some duas. Our Umrah had started! There would be time later for Asar and Magrib prayers and also for having lunch as we were starving because of the long journey! It was almost 7 pm now. We saw the sunset and the view was fascinating. The gradient colors in the sky were mind-blowing, it is just the beauty of Allah (S.W.T)’s creations. Mashahallah! It took us about 2 and half hours to reach Makkah. It was amazing. After we reached our hotel which was Millennium Makkah, we waited for about an hour in the lobby because the receptionist could not find our family name on the list. Finally, when he found it we went to our rooms. When we went to Haram there were many people and the place was very crowded. My first sight at Kab’aah was the most amazing. My eyes were filled with tears. I just could not believe my eyes, I couldn’t believe where I was standing! We started our Umrah in the name of Allah and started doing the Taw’aaf. My eyes were staring at the Kab’aah all along. We finished our seven Taw’aaf rounds but we were not able to touch Gilaf-e-Kab’aah as we were in Halat-e-Ihram. We headed towards Sa’ee, the two mountains named Saf’aa and Marw’aa, where we took seven rounds once again. We weren’t tired during Taw’aaf but Sa’ee was much more tiring for us during the Sa’ee as the rounds were much longer and we were immensely tired too. We finished our Umrah by cutting our hair, and the gents completed it by shaving their hair off! We were incredibly happy and a feeling of peace held our heart! Although we were tired, we still managed to celebrate a little by talking about how it went. We were very sleepy so we slept soundly till the next morning. The next pleasant morning we all went to pray Fajar in Haram. Later after breakfast, we rested for a few hours and after praying Zohr we all met each other in front of the McDonalds sign. Finally, we went shopping. In the Mall, there were many things like mugs, pencils, pens, key chains, bracelets, headbands, rings, etc. We purchased a lot of things and the workers carved our names on mugs, key chains, pens and pencils (these are a few to mention). Last but not least we went to buy colorful Tasbi. When we finished our unstoppable shopping it was the peak time of ASR so we all ran to pray ASR. 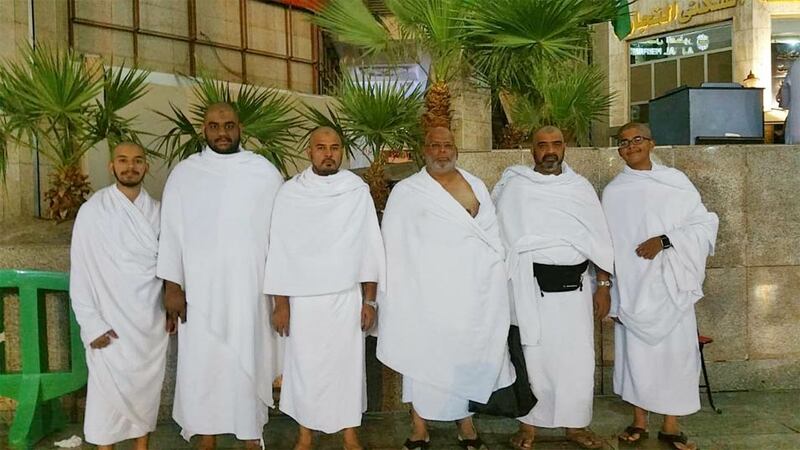 When we came back from praying ASR we met Obaid, Kamran, Taha in ihram as they were going to perform their second Umrah. When we all saw Hina she was also in her abaya so they all said Allah Hafiz and went to perform Umrah. Later we prayed Magrib and stayed in the Haram for another hour praying isha. When we prayed isha we came to the hotel and then there was a guest who brought AL.BAIK so we ate AL.BAIK. After eating we went to our rooms and then slept soundly. Another pleasant morning arrived! We prayed Fajar and then we all went for Ziarats. We saw new places just like Mina, Musdalfa, Arafat, Ghar-e-Hira and more beautiful mountains. We prayed ASR and then went to see the beautiful Kabootar Chowk. Kabootar Chowk is well-known for its beautiful pigeons. The next day, all of us performed our second Umrah. It was not at all tiring, We started Taw’aaf at dawn and were finished at around 7:30 am. We were finished with Sa’ee at 9: 00 am. It was a great experience. We took a small nap and went to pray our prayers. It was Friday so it was pretty crowded. Moving on, after ASR we went shopping again. I performed the Alvid’ai Taw’aaf the next day and Alhamdulillah. I got a chance to touch the Gilaf-e-Kab’aah. it seemed like I was in a beautiful dream but I knew this dream was real. On another memorable day, we prayed Fajar and then took our suitcases and carried them towards the bus which took us to Jeddah. On our way to Jeddah, we saw a herd of camels so the driver stopped the bus. We walked out of the bus and touched the cute camel babies and their parents. We also drank the milk of the camel. It was really yummy. After that, we got back on the bus and then moved towards Jeddah. Finally, we reached the Jeddah airport to fly towards Karachi! We were all very excited We boarded another bus which took us to the airplane. When we reached Karachi, we took our suitcases and then I made a dua, "May Allah invite us to His House again and again!" At the Airport our Uncle and Aunty awaited us with flower necklaces in their hands. They were so excited to see us all happy and together! We all were really tired so we went to our own houses and slept soundly.